Oil on canvas: 17 3/4 x 21 3/4 in. 45.1 x 55.2 cm. Although the supreme master of the architectural capriccio in late eighteenth century France, Hubert Robert also practised as an occasional topographical painter and has left us valuable documents of his home city as it evolved during his lifetime. The Burning of the Hotel Dieu and The Ruins of the Hotel Dieu (1772), and the Demolition of Houses on the Pont au Change (1778), are all works which chart the changing face of Paris as its mediaeval heart was torn out. In 1777 he exhibited two views of The Park at Versailles which led to his appointment as Dessinateur des Jardins du Roi the following year. A view of the Chateau de la Roche-Guyon is in the Musee des Beaux-Arts, Rouen (see Hubert Robert et la Revolution, Musee de Valence, 1989, cat.no.5). 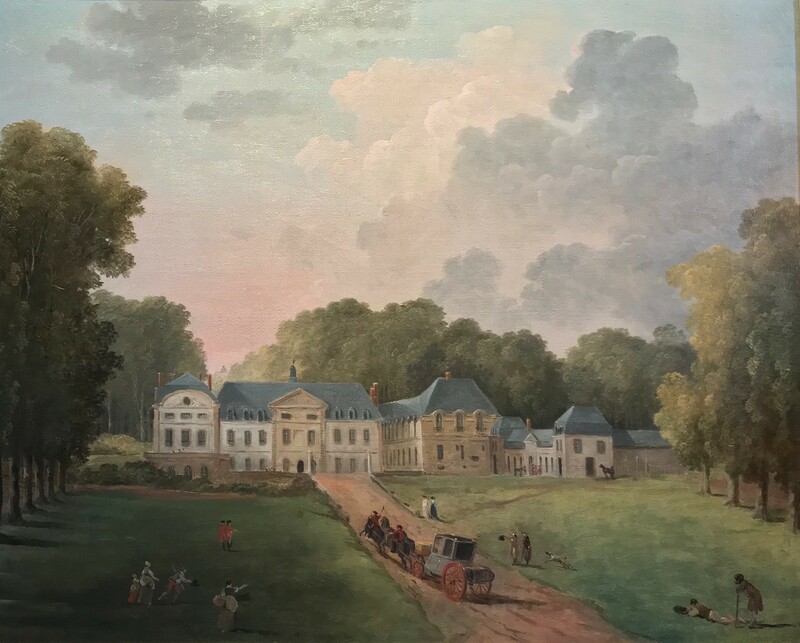 Despite the ancien regime details such as the carriage with its armorial bearings, the attendant guards and somewhat languid gardeners, the loose dresses and large hats of the two ladies in front of the chateau would suggest a date in the very late 1780’s or even early 1790’s for our painting. I am writing to enquire about "A View of the Chateau de Francieres near Compiegne, home of the Marquis de Tracy"